In any matter, your potential e-discovery burden will greatly affect your case strategy. What if you could immediately—right after receiving a complaint—not only know how much likely data you would need to search, collect, process and review, but also have access to potentially responsive documents prior to collection? New e-discovery technology now empowers legal teams to do just that with in-place Early Case Assessment (ECA) capabilities. In our new technology webcast series, you will hear from technology experts along with in-house legal professionals like yourself on what e-discovery tools they are keeping an eye on and those that have made a lasting impact on their legal departments. 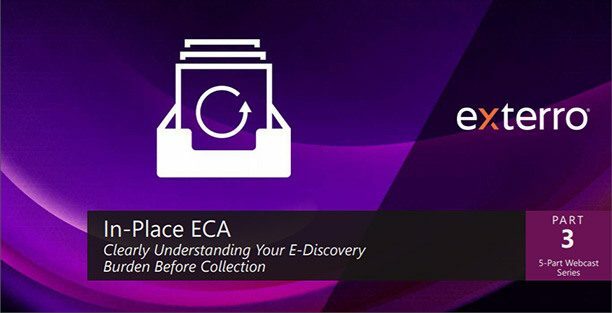 This webcast will discuss how in-place ECA works, how other leading legal departments are using it, and why this technology will enable you to make big case strategic decisions earlier, saving you time and money. NOTE: These sessions will be product agnostic, and not feature specific vendor products.